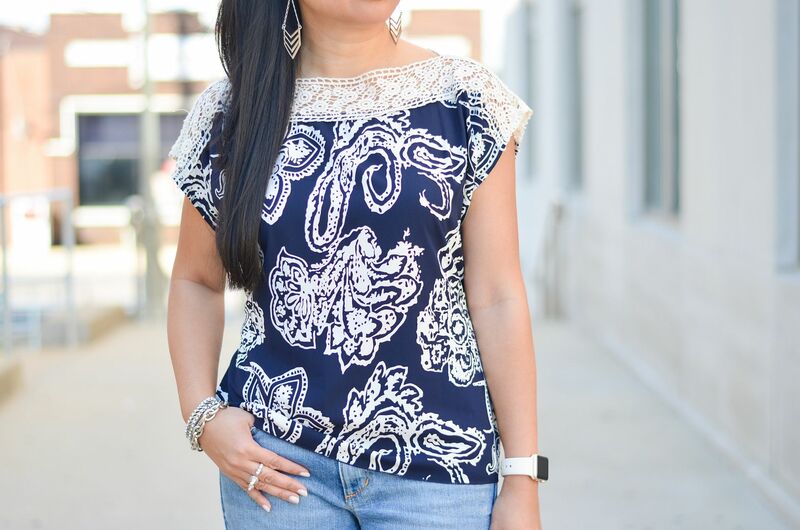 I love how frilly this top looks, especially in comparison with these super ripped jeans. It makes for an effortless combo. I had to throw in the pop of pink because navy and pink work so so well together. And since these jeans have a hint of a relaxed fit to them, wearing them with the pointiest and sassiest of heels is a definite must to keep the overall look feminine. At the end of July, we actually had a free weekend with no plans! We took advantage of some time off by going through a major purge! A couple of our guest bedrooms have been overridden by a bunch of our crap, so we each went through our piles and ended up with 11 bags and 3 boxes to drop off at Goodwill! Crazy! The majority of the stuff I simply donated because it's easier and there were a lot of pieces that I didn't think merited the time to properly photograph and try to sell. (Maybe if I had an intern, that would be a different story!) There are several pairs of shoes though that I did hold on to with aspirations to list on eBay. On a whim last Friday after work, I decided to experiment with the new Instagram Stories feature and hold a shoe sale. I listed 14 pairs of shoes and within 24 hours, I sold 7 pairs. I will call that a success! I may do these Friday flash sales regularly, so if you're a size 6 and you're not following me on Instagram yet, you probably should! 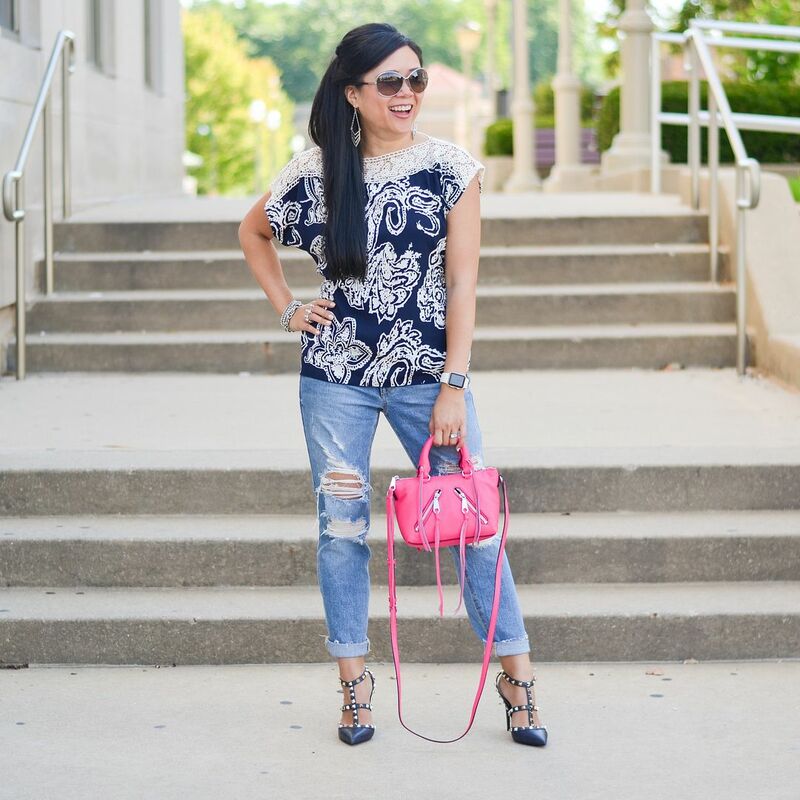 Gorgeous top and loving the vibrant pink from your bag! Love this look and these jeans are perfect! Eventually I may jump on that ig sale too. That top is so cute, and of course love the shoes! 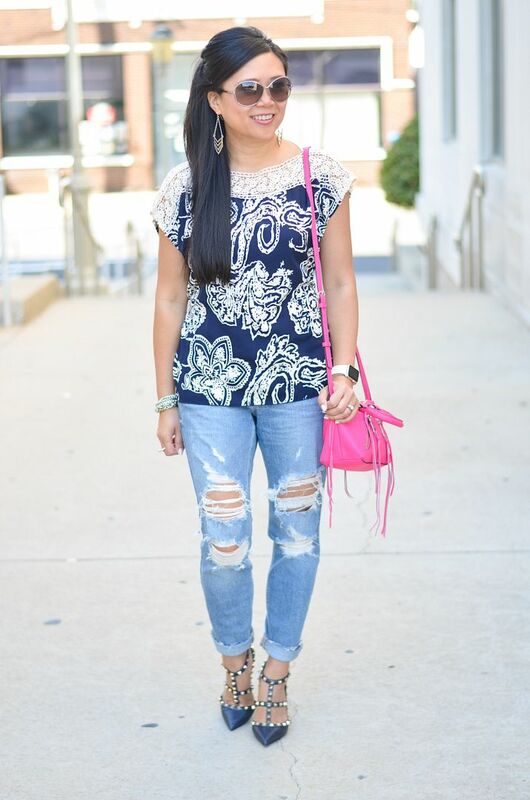 Love how you paired with top with the ripped jeans and pops of pink! THose V heels are magnificent!!! 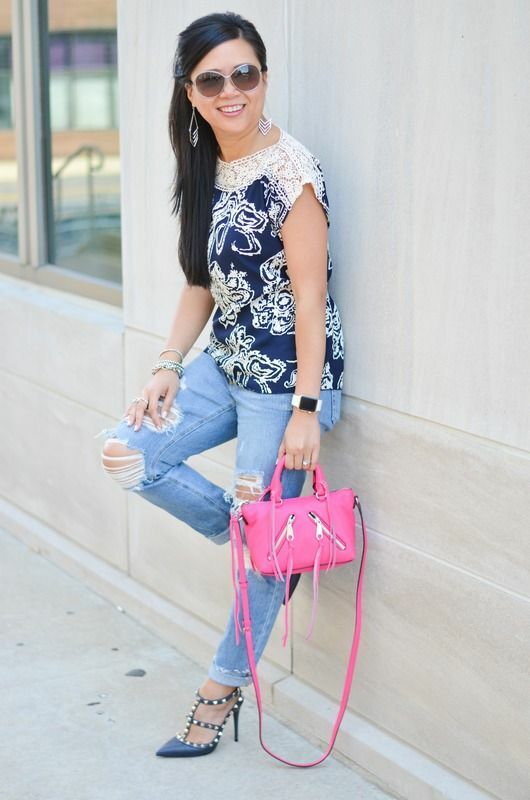 The mix of lace and distressed jeans are such a good combo. I have a pair of Rag & Bone's that are similar except all the 'frayed' parts are gone and it's just holes now. I love paired with heels. And these rockstuds are perfect. Your IG selling success is fantastic! And I actually had that same thought when they started the stories...I just haven't gotten around to it! I liked the idea of selling on Snapchat as I had seen other people do (super easy listings, no fees), but I doubt I have enough of a following there vs. that would want to buy. So the IG stories seem perfect and obviously were effective for you! I also liked your detailed purchase instructions there. And I'm in love with this whole outfit. It could almost make me consider purchasing a similar printed top. *Almost. * Lol!